Sometimes, a project just doesn’t want to cooperate. It’s frustrating, it’s infuriating, it makes you want to rip your hair out and scream. We’ve all been there. Heck, I was just there on Sunday. I thought that Attempt #2 was finally going to be the thing that made the armor piece of my new Mara Jade costume work how I intended and then it just looked stupid. There went my hopes of finishing the bulk of the costume that weekend. It was one of those situations that just made me want to throw it all away and quit cosplay forever. If you’ve been in this hobby for more than year, you’ve probably faced those moments and if you have yet to… well, brace yourself. And you know what? It’s totally okay. You just need to find out what can help you move past your frustrations. Over the years, I’ve figured out a few tricks. Sometimes, when something isn’t working or I just can’t figure it out, I sit back and I stare at it for a while. 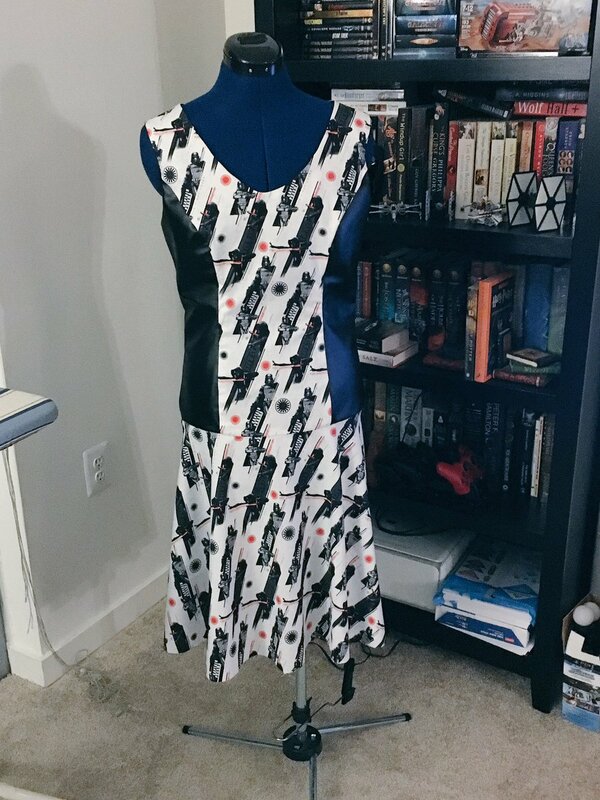 This usually involves putting whatever parts of it I do have up on my dress form, moving my dress form into the living room so it stares me down while I watch TV, and just letting my brain mull over it in the background while doing other things. I’ll also sit on the ground, pull out all my reference images and spread them out, and just try and work through a new plan. Admittedly, this is more helpful with the lower level stress but not actively working on something can still help your frustration levels go down a bit. In other words, treat yourself to a confidence booster. For me, this usually involves making a cute, geeky dress. It doesn’t have to be a big project and it definitely doesn’t even have to be related to cosplay. This is a coping method I’ve been using a lot over the last year or so and it’s actually resulted in some neat costumes and outfits. It doesn’t have to be sewing related though. Are you good at crafting? Graphic design? Baking? Honestly, anything that you know you’re good at will help make you feel a heck of a lot better. Confidence can be a very fragile thing and it’s always good to give yours a little TLC. Run away with us for the summer, let’s go upstate! Wait sorry. Those are Hamilton lyrics but Angelica and Eliza are right. You can’t keep working non-stop without burning out. Even if you’re working under a deadline, sometimes the best thing that you can do is take a break from working on a project and go do something completely unrelated to cosplay. Go see a movie, enjoy the sunshine, read Star Wars: Bloodline, get some froyo, engage in a rap battle with Thomas Jefferson over states’ rights. (Maybe don’t have a torrid affair and write it all down though.) It’s up to you! Just put all of your costume stuff away and don’t think about cosplay for the rest of the day. The recharge will likely do your mental state a world of good. So the short version? Just let it go for a bit. Remember that everyone who costumes eventually has a point where they get supremely frustrated and want to walk away. Even the people who cosplay professionally have almost definitely had those moments. Don’t let it defeat you and do what you need to do to recharge. Taking care of yourself first will always be more important than making a costume. Sometimes that means putting a project away for months and sometimes that just means going outside and screaming for a few minutes. Find what works for you. Maybe it’s a combination of all of this. Do you have a preferred method for coping with costume stress? Share it in the comments!